On December 10, Vice President Wang Qishan will attend upon invitation the opening ceremony of the 2018 Imperial Springs International Forum in Guangzhou. As an important forum to promote friendly exchanges between China and other countries, the Imperial Springs International Forum has been held for four consecutive years since its inception in 2014 by the Chinese People's Association for Friendship with Foreign Countries (CPAFFC) and the Australia China Friendship and Exchange Association (ACFEA). The 2018 Imperial Springs International Forum will be held from December 9 to 12 under the theme of "Reform, Opening-up and Win-win Cooperation", which will be attended by former foreign dignitaries, former heads of international organizations, prominent experts and scholars and business leaders. 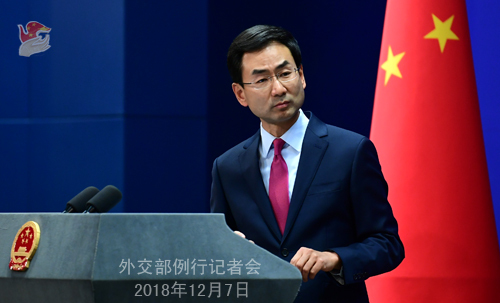 At the invitation of State Councilor and Foreign Minister Wang Yi, Foreign Minister of the Republic of Colombia Carlos Holmes Trujillo will pay an official visit to China from December 12 to 15. Foreign Minister Trujillo's visit is scheduled as one of the important exchanges between the Chinese and Colombian governments this year. It will also be the first political contact between the two sides after the new Colombian government came to power. During Foreign Minister Trujillo's visit, Vice President Wang Qishan will have a courtesy meeting with him, and State Councilor and Foreign Minister Wang Yi will co-chair with him the ninth political consultation between the two foreign ministries. The two sides will have an in-depth exchange of views on the development of bilateral relations in the new era and other issues of mutual interest. We believe that Foreign Minister Trujillo's visit will help enhance bilateral political mutual trust, chart the course for the next-stage development of bilateral relations, and elevate China-Colombia relations to a higher level. China attaches great importance to developing its relations with Colombia which is an important country in Latin America. Recent years have witnessed the sound development of China-Colombia relations featuring stronger political mutual trust and fruitful practical cooperation outcomes between the two sides. China-Colombia friendship has become a consensus shared by all sectors in the two countries. The new Colombian government also attaches great importance to its relationship with China. The Chinese side commends that and stands ready to work with Colombia to deepen bilateral exchanges and cooperation in various fields, jointly advance the Belt and Road Initiative, enhance China-Colombia relations and China-Latin America cooperation in parallel, and forge a community with a shared future between China and Latin America. Q: According to Japanese media, the Japanese government plans to ban government purchases of Huawei and ZTE products. What is your comment? A: We are gravely concerned about the relevant reports. The Chinese government always encourages Chinese enterprises to observe market principles and international rules as well as local laws in their overseas investment and cooperation activities. The economic and trade cooperation between China and Japan is in its nature for mutual benefit and win-win outcomes. Huawei and ZTE are law-abiding companies that have long been operating in Japan. We hope that Japan could offer a level playing field for Chinese enterprises there and refrain from doing anything that may undermine bilateral mutual trust and cooperation. Q: The Foreign Ministry this morning announced the visit by Ecuadorian President Lenín Moreno. Could you offer us more details on his schedule? What is China's expectation for this visit? How do you comment on the current China-Ecuador relations? A: At the invitation of President Xi Jinping, Ecuadorian President Moreno will pay a state visit to China from December 11 to 13. President Xi Jinping will hold a welcoming ceremony and banquet for President Moreno and host formal talks and attend signing ceremony with him. Premier Li Keqiang and Chairman of the NPC Standing Committee Li Zhanshu will meet respectively with President Moreno. The two sides will have an in-depth exchange of views on bilateral relations and issues of mutual interest. President Moreno will also attend other events including the China-Ecuador Economic and Trade Cooperation Forum. Relevant departments and companies on the two sides have held many rounds of discussions on the outcomes of the visit. The final details are yet to be finalized. We will release them in due course. China believes that President Moreno's visit will further enhance bilateral political mutual trust, deepen mutually beneficial and friendly cooperation in various fields, and open up new prospects for and elevate China-Ecuador Comprehensive Strategic Partnership. Ecuador is a comprehensive strategic partner for practical cooperation with China in Latin America. In recent years, China and Ecuador have been developing bilateral ties with a sound momentum, reaping fruitful outcomes from all-around cooperation, and deepening traditional friendship. We are glad to see that more and more Latin American countries including Ecuador have responded positively to China's Belt and Road Initiative. During President Moreno's visit, the two sides will sign a MOU on jointly advancing the Belt and Road Initiative which will offer more opportunities and open up new space for China-Ecuador practical cooperation. China attaches great importance to its relationship with Ecuador. We are willing to work with Ecuador to act on opportunities and tap into potentials and ensure the sustained and steady development of the China-Ecuador Comprehensive Strategic Partnership. Q: Today, State Councilor and Foreign Minister Wang Yi held talks with DPRK Foreign Minister Ri Yong-ho. Can you give us more information on that? Will President Xi Jinping meet with Foreign Minister Ri Yong-ho? A: This morning, State Councilor and Foreign Minister Wang Yi held talks with member of the Political Bureau of the Central Committee of the Workers' Party of Korea and DPRK Foreign Minister Ri Yong-ho. The Chinese side will soon issue the readout. Here I can briefly talk about that. During the talks, State Councilor Wang Yi said that this year General Secretary Xi Jinping and Chairman Kim Jong Un held three important meetings and reached a series of important consensus, moving the bilateral ties into a new historical period. The Chinese side is willing to work with the DPRK to promote the greater development of bilateral relations in accordance with the important consensus reached by the two top leaders and the shared aspirations of the two peoples. State Councilor Wang Yi also said that now the situation on the Korean Peninsula generally sustains the momentum for detente. China and the DPRK should continue to promote the positive development of the situation on the Peninsula in the direction of denuclearization. 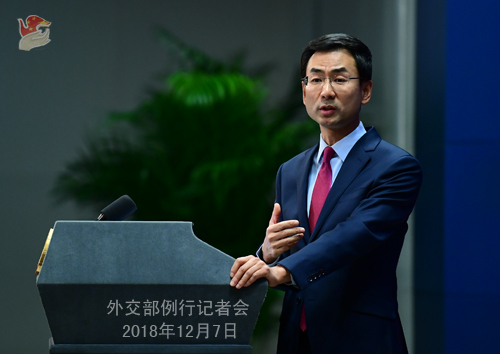 China hopes that the DPRK and the US can maintain dialogue, address each other's concerns in a balanced way and achieve the goals set in the DPRK-US joint statement. China also supports the DPRK and the ROK in enhancing exchanges and interactions and advancing reconciliation and cooperation. Foreign Minister Ri Yong-ho said that this year Chairman Kim Jong Un paid three visits to China and reached a high degree of agreement with General Secretary Xi Jinping on developing the relations between the two parties and two states. The foreign ministries of the DPRK and China have made positive progress in implementing the important consensus reached by the two top leaders. Next year we will celebrate the 70th anniversary of the establishment of diplomatic ties between the DPRK and China. The two sides should make joint efforts to ensure the success of the commemorative activities, deepen traditional friendship, strengthen exchanges and cooperation in various areas and elevate China-DPRK relations to a higher level. Foreign Minister Ri Yong-ho also said that the DPRK is committed to realizing the denuclearization of the Peninsula and upholding peace and stability on the Peninsula, and such position remains unchanged. He hopes that the DPRK and the US can establish necessary mutual trust and earnestly meet each other halfway. The DPRK commends the positive efforts made by China to promote the political settlement of the Korean Peninsula issue in light of the changes of the situation and stands ready to maintain communication and coordination with China to jointly uphold the stability and development of the Peninsula and the region. Regarding the Chinese leader's meeting with Foreign Minister Ri Yong-ho that you are interested in, according to my information, the meeting is scheduled for this afternoon. The relevant readout will be released soon after the meeting. Q: US National Security Adviser John Bolton said that he was aware of the detention of Meng Wanzhou before President Trump's meeting with President Xi Jinping. Was the Chinese side also aware of that before the meeting? Was this matter discussed during the meeting? A: I have taken similar questions yesterday. I do not want to talk about the specifics of this case here. But I can tell you that after learning about the relevant situation, the Chinese side immediately provided consular assistance to the person concerned and lodged stern representations with and made clear its solemn position to the Canadian side and the US side, demanding them to immediately clarify the reason for the detention and release the detainee, and earnestly protect the legal and legitimate rights and interests of the person involved. Q: Regarding the detention of Meng Wanzhou, can you brief us on the communication between China and Canada? It is conjectured that China may take retaliatory actions. What is your comment? A: Like I said just now, after learning about the relevant situation, the Chinese side immediately provided consular assistance to the person concerned and lodged stern representations with and made clear its solemn position to the Canadian side and the US side, demanding them to immediately clarify the reason for the detention and release the detainee, and earnestly protect the legal and legitimate rights and interests of the person involved. 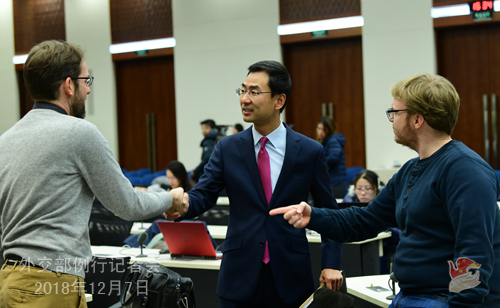 On your second question, the Chinese side always protects the legal rights and interests of the foreign citizens in China according to the law. Of course, they should also abide by the Chinese laws and regulations when they are in China. Q: Have you received any response from the US or Canada to that request for details about the reasons for Meng Wanzhou's detention? Have you been given any details of the specific allegations against her? Some US business executives in China are concerned that they might be targeted for retaliation. Should they be concerned? A: On your first question, like I said just now, the Chinese side immediately lodged stern representations with and made clear its solemn position to the Canadian side and the US side. I will not repeat that. What I can tell you is that neither Canada nor the US has provided any evidence to China to prove that the person involved violated their laws so far. On your second question, in my reply to the previous question, I said that China always protects the legal rights and interests of the foreign citizens in China according to the law. Of course, they should also abide by the Chinese laws and regulations when they are in China. Q: Yesterday, a reporter raised a question on which country's passport Meng Wanzhou held when she entered Canada. Some media conjectured that Meng Wanzhou is not a Chinese citizen. What is the Foreign Ministry's response to that? A: When answering relevant questions yesterday, I said that I cannot talk about the specifics of the case here. But one thing I can assure you is that according to the Nationality Law of the People's Republic of China, Meng Wanzhou is a Chinese citizen.